US, 2016, 116 minutes, Colour. Amy Adams, Jeremy Renner, Michael Stuhlbarg, Forest Whitaker. For almost 200 years science-fiction has been developing, from 19th-century authors like Jules Verne and into the 20th century with H. G. Wells. Novels and short stories as well as comic books have been the way to communicate these stories but, especially during the 1950s, many films, generally B-budget, took audiences into the realm of science-fiction and fantasy. While there were many versions of Verne’s and Wells’ stories, science-fiction became very respectable in 1968 with Stanley Kubrick’s 2001: A Space Odyssey. In more recent years, there has been a great interest in space and space travel with films like Gravity, The Martian, Interstellar. In the 1970s, there were two classic films about aliens and alien life, hostility with Alien, and friendliness with Spielberg’s Close Encounters of the Third Kind. The reaction to alien pods in Arrival is initially one of suspicion, the tradition of the War of the Worlds, but Arrival is a film in the Close Encounters tradition, close encounters for the 21st century. The film is the work of Canadian director, Dennis Villeneuve, who made a strong impact with his film about the Middle East and Canada, Incendies. Working in English, he has made the striking dramas, Prisoners and Sicario. His next film, the sequel to Blade Runner. 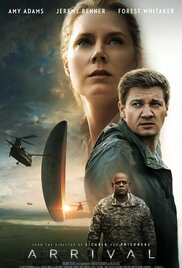 The film opens with a linguistic expert, Louise (Amy Adams) trying to give a lecture but interrupted by phone calls and news of 12 giant pods hovering over different locations throughout the world. At her home, she speaks to her daughter, the beginning of her story – but we discover, through flashbacks, that the daughter has grown up, become ill, has died. Into this mysterious context, the American military arrives, in the form of Forest Whitaker, to take Louise to the Montana headquarters confronting the pod over the US, along with a science expert, Ian (Jeremy Renner). Together they are to interpret the communications from the aliens and to probe the science behind the arrival. The perfect will pods may seem sinister to eyes used to watching disaster films, but their perfect form is reminiscent of the monolith in 2001. While there is military alertness, especially from a general in China, this is not a film about war, not a variation on Independence Day.Rather, the two investigators have sessions with the strange aliens, looking something like octopi with seven tentacles, who make sounds but who also squirt Rohrschach -looking circular diagrams which Louise has to interpret, trying to find words and meanings. There is anxiety around the world, communication, then closing of communications, and some deadlines for discovering the truth. At the end, Louise realises that the aliens have a different understanding of time, not linear, rather circular – which gives more meaning to Louise, relationship, the conception of her child, the child’s life and illness. At the end, also, there are signs of hope, a benign interpretation of the aliens and their continued care for humans and encouraging them to unity and peace. So, a more thoughtful contribution to the tradition of the science-fiction of an intelligent life in space. 1. The division of science fiction films? 19th-century stories, Jules Verne, H.G.Wills? The 19th century and the development of science-fiction imagination? Into the 20th century? Into the 21st century? 2. The contact stories: the War of the worlds, alien invasions, serious, the horror touches? 3. Aliens in the 1970s, aggressive in Alien, the contrast with Close Encounters? The 1990s and Contact? The tradition of 2001: A Space Odyssey? 4. The 21st century, Gravity, The Martian, Interstellar…? Visual impact? Intellectual content? 5. Arrival and the plausibility of the plot? The presence of the aliens? The need to communicate? Human fear, military response? The contrast with the dialogue of language, scientific investigation, communication? 6. Louisa story, the beginning of the story and her talking to the child, the daughter growing up, the memories cues for flashbacks on her understanding her mission and dialogue with the aliens? Her daughter’s illness, death, the father’s absence, her grief? The complexity of this plot, the flashbacks to different times – and, with a different understanding of time, the flash forwards? The blend of joy and sadness? Knowing of her daughter’s illness and death? The father unable to face this? The question posed that if we knew what was to come, would we change anything? Louisa’s response, Ian’s response? 7. Louise at work, the students had their phones, the language class? The sirens, the warning, evacuation of the University, cars crashing into each other, her returning home, being alone? The kernel arriving, his interview, who is a sensor and asking the expert at Berkely about Sanskrit? The test, the Col’s return, the helicopter, taking her to Montana? 8. The situation, media coverage, media information, the military headquarters, the variety of screens, different locations for the pods? Connection and then the disconnect? The military information, the political background? 9. The pods, the visuals, the different locations around the world? The American response? Chinese response? China in military? Russia? The sedan? Rights in Venezuela? 10. The setup of the camp, the tents, offices, the monitors, the large staff, the phone connections? The kernel, the different military officers? The political representative and is contact with Washington? The medical staff for testing, especially for radiation? Preventative medication? 11. Ian, his background, science, in the helicopter with Louise, the medical tests? 12. The pods themselves, the creatures, have to try on is, their appearance, audience response to aliens, apprehensive must, fears (and the historic wife the phone with her officer husband)? The aliens and allowing the sessions for communication, the barrier, Louise with her posters and names, moving to interviews? Theory about dialogue, techniques of dialogue and focus on questions, techniques for answers? The aliens, their squirting their responses, the raw shark images, the sounds? The steps and process of interpretation, building up a vocabulary? Who is protective? The decision to remove her protective gear? To become real, trust? The effect? Ian following? 13. China, the general, the military reaction, fears? The American Hawks and wanting Neocon strikes? The preparation of the met American military? The bomb, the time, the explosion? 14. Louise, interaction with Ian, sharing the experiences, progress, at the computers, the discussions, the theories? 15. The political representative, his harsh perspective? 16. Louise, the effect of the experience, dreams, flashbacks, ideas, a decision to go out to the pod, being received, her experience within? 17. A return, the reaction – the shift in time, the audience understanding non-linear time, the flash forward to 18 months, the encounter with the Chinese general, his appreciation, whispering in her ear, that she was able to tell him his wife’s last words, his calling off the attack? The return to the situation, Louise taking the political advisors phone, the pursuit, willing to shoot, her contact with the Chinese general? 18. The role of the aliens, guardians, wanting to help humanity, forcing disaster in the future, their presence, communication, there wanting humans to unite amongst themselves – and Louise at the celebration? 19. Louise and Ian, love, this story? The conception of their daughter – and the prospect of her life and death? The grim underlying touch? 20. 21st-century science-fiction, special effects, imagining contact with other worlds and creatures, positive communication – Food for thought?